This event is only a week away! Here is an updated announcement with a little more info than the first one... The Andover Snowmobile Club will be hosting our 16th Annual Highland Lake SnoFest on Saturday February 16th, 2019 at the East Andover Fish and Game Clubhouse located on Snowmobile Corridor 2 (Railbed) and Highway Rt. 11. Event will be held from 9am - 2pm. Event is open to all antique and vintage snowmobiles and is FREE to register and attend. Trophies will be awarded to 4 different categories, People's Choice Antique (pre-1969), People's Choice Vintage (1970-1994), People's Choice Most Unique (Any year snowmobile), and our chairman's award, The George Burdick Memorial Award (Any year Snowmobile). We also have a trail permit to allow trail riding to snowmobiles 25 years and older with no state registration. NEW THIS YEAR will be a snowmobile poker run. 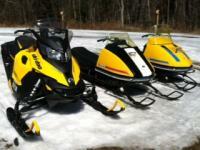 The poker run will be approximately 10 miles and is open to snowmobiles new and old! Cost of the poker run will be $5 per hand and prizes will be awarded to the winning hand. We will also be doing a 50/50 raffle throughout the event. Winners for the poker run and 50/50 will be announced before the trophies are awarded at 2pm. Winners do not need to be present. We will have hot food, drinks, and a warm clubhouse to relax and enjoy vintage snowmobile videos and stories. Food and drinks are Donation Only. Dig out those old snowmobiles or just swing by to check out some awesome snowmobiles from yesteryear! We hope to see you all there!!! How about a video??? This was Saturday in Andover. The Andover Snowmobile Club would like to thank everyone who came out and supported our annual Italian Buffet last night, and to AEMS for allowing us to use the school for the event. We had a great turnout, with well over 200 guests! The dinner was a great fundraiser for our club, and the raffle tables made a record amount of money for Easter Seals Camp Sno-Mo which will be delivered to the Easter Seals Ride-In next weekend. Also, thank you to all of the volunteers that helped make everything happen. This event wouldn’t be possible without all of your support. Andover Snowmobile Club's Annual Italian Buffet Saturday, January 26, 2019 5:00 pm - 6:30 pm at the Andover Elementary Middle School, Main Street, Andover, NH Adults $10.00 Kids 12-6 $5.00 Children 5-under Free Come enjoy spaghetti, meatballs, hot Italian sausage, meatless sauce, lasagna, tossed salad, garlic bread & a wide variety of homemade desserts, as well as drinks. 6:30 pm is the 50/50 drawing & immediately following is the 100+ multi-item raffle with all proceeds benefiting “Camp Easter Seal” (Camp Sno Mo) in Gilmanton, NH. Camp Sno Mo provides camping for handicapped / special needs children / young adults. Club Memberships will be available. Club Clothing will be available and orders will be taken. Steve, The plate on my TNT is mounted on the dash behind the windshield, and is held on by a few small strips of 3M hook and loop tape (the "Velcro" type stuff). It works great. My Olympique plate had already been drilled and bolted on to the trunk by the previous owner, otherwise I would have used the 3M tape for that too. Wow! Nice ride! I tried to make it to Old Hill Village on Thursday night but turned around for lack of snow. Should be in real good shape now after yesterday’s storm though. When I joined my club a few months ago through the portal I was able to print out my voucher at that time. I never heard anything from the club, but I already had my voucher so there was no need to. Sounds like there was a step missed somewhere in the process. Like RK-SXViper says, I'm sure NHSA can straighten it out for you. 2002 Polaris XC SP 600. M10 suspension, electric start, reverse, 96 studs, dual runner carbides, heated shield outlet, hand warmers, thumb warmer, mirror, Polaris windshield bag, Polaris tank bag, Polaris cover, spare belt, spare plugs. Excellent condition, runs perfect. Track is in great shape. Always ran synthetic oil. Always stored inside or in enclosed trailer. 5762 miles. $1800 or BRO. I may be interested. I’ll keep an eye out for your ad tomorrow. Thanks. LOL. No, but somehow I don’t think she would appreciate the 2” of suspension on the Elan considering the sled she rides now has M-10 suspension. The 12 horsepower engine would be perfect for her though. Congrats. I'll be interested to hear how you like it. I've been looking around for one for my GF to ride. She doesn't have much experience at all, and the spare sled I have has way more power than she needs. I think the 600 ACE would be perfect for her.